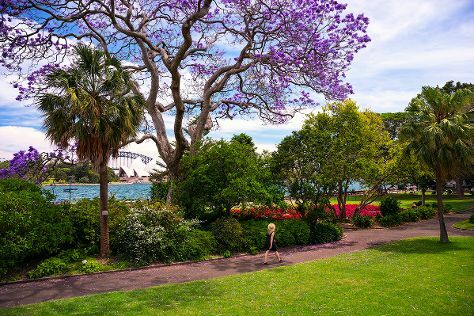 On the 22nd (Sun), admire the striking features of Sydney Opera House and then take in nature's colorful creations at Royal Botanic Garden Sydney. To see reviews, photos, ratings, and other tourist information, go to the Sydney online tour itinerary planner . Cardiff, UK to Sydney is an approximately 28-hour combination of train and flight. You can also fly; or do a combination of train and flight. The time zone difference moving from Greenwich Mean Time to Australian Eastern Standard Time (New South Wales) is 10 hours. Prepare for much warmer weather when traveling from Cardiff in December: high temperatures in Sydney hover around 32°C and lows are around 21°C. Wrap up your sightseeing by early afternoon on the 22nd (Sun) to allow time for travel to Melbourne. To see ratings, where to stay, and tourist information, go to the Melbourne road trip tool . Getting from Sydney to Melbourne by flight takes about 3.5 hours. Other options: do a combination of flight and shuttle; or drive. Traveling from Sydney in December, Melbourne is little chillier at night with lows of 14°C. You will leave for home on the 22nd (Sun).